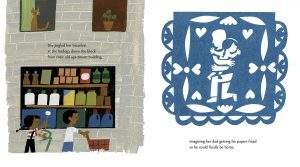 Answering the demand for more contemporary stories for children, the award-winning team of Matt de la Peña and Christian Robinson conveys the dreams, wishes and everyday antics of a young child of immigrants in Carmela Full of Wishes. The story is set in a migrant community steeped in Mexican culture. It is Carmela’s birthday and she is finally old enough to go into town with her big brother. Of course, her brother is not thrilled, but young Carmela sees this as an adventure. She proudly jingles her birthday bracelets as the two run family errands in their busy community. They pass fields of farm workers, Miss Maria’s vegetable stand . . . the panadería with sugary treats. When Carmela finds a puffy white dandelion growing in a crack in the sidewalk, she wonders what else she could possibly want and sets out to find the perfect wish. Would it be a candy machine . . . a bed for her mother as fancy as the ones she spends all day making for hotel guests . . . or would she wish for her father’s papers to be fixed so he could finally come home. Paying homage to the vibrancy of Mexican culture, illustrator Christian Robinson visualizes Carmela’s wishes with papel picado – Mexican hand-cut paper banners. Most compelling is the image of a returning father kneeling to embrace his daughter. You cannot help but appreciate the honesty of this story. Carmela’s family, like millions of others in the United States, lives the immigration debate everyday; but de la Peña and Robinson remind us that Carmela is a child first. She plays on her scooter, jingles her bracelets, teases her big brother and wishes on a dandelion – like children everywhere. With a vibrant portrayal of Carmela’s community, a sprinkling of Spanish vocabulary, and a strong focus on universal themes, we see Carmela exactly as she is. Her story will resonate with all those, young and old, who see a world of possibilities in the face of hardship. For older students, Carmela Full of Wishes provides a meaningful platform to engage with sensitive issues of immigration, class and family separation.